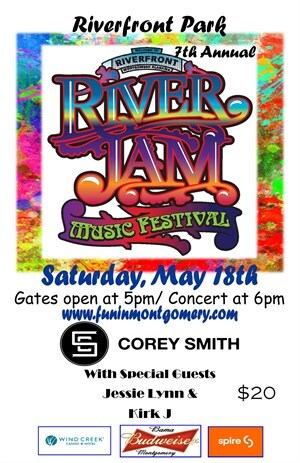 This year's River Jam Music Fest, located in Riverfront Park, will feature live entertainment from Corey Smith with sepcial guests Jessie Lynn & Kirk J. All tickets are general admission. Chairs and blankets welcome. Come Jam with us on the banks of the ALabama River!! No refunds or exchanges. No outside alcohol allowed. All children must be accompanied by an adult. Riverwalk Amphitheatre - GPS 355 Commerce Street, Montgomery AL 36104. Weekday phone number 334-625-2100. Facility requires walking for entry and is handicap accessible. The Riverfront area is an open air park and does not have fixed seating. Lawn chairs and blankets are welcome. No umbrellas or stakes. In case of rain, ponchos are preferred. All items are subject to search upon entry. All children under the age of 12 must be accompanied by an adult. Security onsite. Concessions & cash bar are available for purchase onsite.